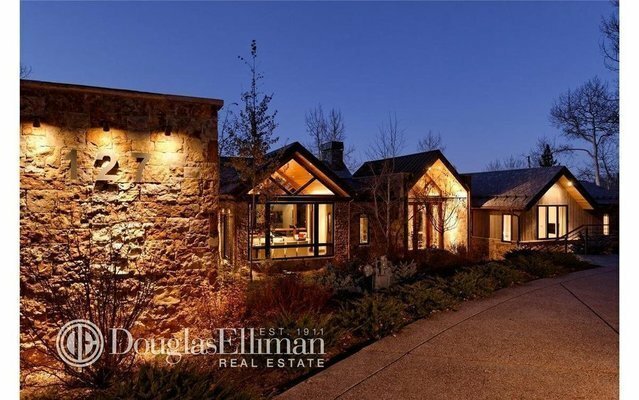 Enjoy the great outdoors inside this beautiful mountain chic modern home in Woodrun. Located on Forest Lane with direct ski access to Funnel and Elk Camp Gondola area, this five-bedroom, six and a half bath home has features only nature can provide. Architect Kim Raymond and builder Keelty Construction combined form and function for the perfect Snowmass home. The entry foyer has a large window offering a dramatic entrance. The interior stone walls, open steel beams and wide plank French oak floors accent the floor-to-ceiling windows in the great room, formal dining and kitchen area.